Share a smile with your loved ones through a bouquet filled with stunning beauty and heartfelt joy. 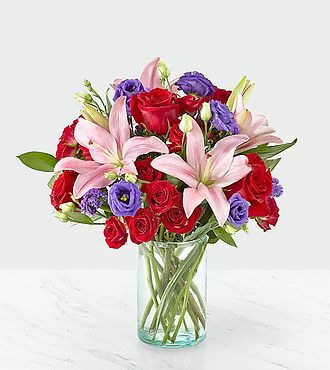 Comprised of vivid red roses, purple double lisianthus, pink lilies and red spray roses within a clear glass vase, vibrant color bursts from every bloom. Make their day brighter with a gift that is Truly Stunning! You save over $6 at FlowersFast! (Compare to FTD retail price: $60 + $22.98 for same-day delivery.) You get the same quality, at a lower price! No extra charge for same-day delivery. FREE personalized gift message included. (Extra delivery charge for Alaska and Hawaii) Same-day florist delivery is available for this item, for orders placed before Noon in the recipient's timezone. Please see the Ordering and Delivery Information.